Nusa Lembongan is an island southeast coast of Bali, the most popular one of the three island. The other two is Nusa Penida and Nusa Ceningan. Nusa Ceningan is the smallest of the tree island, and rarely visited. But the beach has beautiful crystal clear water with colorful coral sea. Great place to do snorkeling. Nusa Penida on the contrary has a scary reputation as a place of banishment for criminals in the time of the Kingdom of Klungkung. But the sea has rich coral reefs and also make a great place to do diving and snorkeling. Don't be confused, what I want to talk about on this page is only Nusa Lembongan. So, can we further? 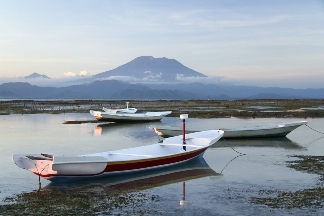 If you want to escape from the hectic pace of Bali, this island would be a great place to visit. There is no hassle, no hawkers, no pollution, no traffic, no cars, what else do you want? The prices around this island are very reasonable. You can get much cheaper than the mainland Bali. If you don’t attach very much on luxury, you can even get the sleep place for just $28 a night. Just a simple bed but clean. This is really a place to relax, and great opportunity to spend holidays with the family. The beach is not crowded, and you can fully enjoy the magnificent scenery of the beach with Mount Agung view on the background, isn’t amazing?? 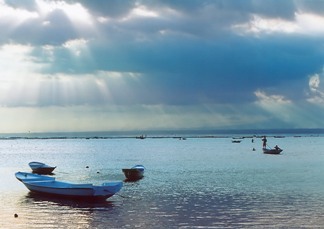 The beach is one of the most bali popular attractions, especially among the surfer. The surf breaks is very famous all over the world. Some are really crowded with surfer. The water is clear with beautiful color, aqua marine blue water with with colorful coral and beautiful fish. It makes very suitable for snorkeling and diving. Mushroom bay, southwest of jungutbatu, the beach has great white sandy beach and cozy little restaurants line the beach. 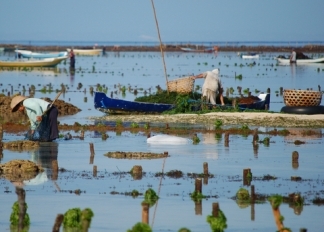 Nusa Lembongan is also the place of seaweed farming, in fact this is the main income of local people. The dried seaweed are keeping in store, and then they taken to the mainland and they are exporting to America, Denmark, Holland and Japan. You probably wonder what seaweed is and what is it for? So, Seaweed is very useful to make medicines, food stabilizer, cosmetic and gelatin for ice cream. It’s amazing what they can do with them. You can also explore the famous Underground house, the unique attraction of nusa lembongan. The house was built only by hammer and intuition as a guidance. This is truly the incredible building. You must see it if you visit this island.